The trailer is light on plot but gives fans just enough of a hint on what to expect from Marvel's next big blockbuster. There are new team members, new outfits and perhaps most important of all - new haircuts. It's the end of a chapter for Marvel, bringing to a close characters and plots that began in Iron Man in 2008. 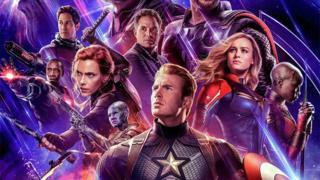 So after more than ten years of the Marvel Cinematic Universe (MCU) - and with previous films breaking box office records, expectations are high for Endgame. Here's what we learned from the new trailer - and just a warning that this obviously contains spoilers for Avengers: Infinity War. During the Guardians of the Galaxy movies and Avengers: Infinity War, Rocket was inseparable from his partner, Groot. But since Groot was lost when Thanos wiped out half of humanity at the end of the previous film, he's now teamed up with War Machine, riding Don Cheadle into battle. They share a love for massive guns, so it's a match made in Marvel heaven. Captain Britain anyone? Who could follow The Avengers? Hawkeye sat out the events of Infinity War. Fans were never really told why and some might say they never asked. But now a moodier, gloomier Jeremy Renner has returned to bring his bow and arrows to The Avengers' showdown against their omnipotent purple alien enemy. Scenes showing him with his daughter suggest losing his family to "the snap" prompted his comeback. He's got a new haircut too, but not everyone's convinced. They've always been on the outskirts of The Avengers, but this time around shrinking superhero Ant-Man and angry blue space robot Nebula are fully-fledged members of the team. They're here to replace people like Black Panther and Spider-Man who were also turned into dust at the end of Infinity War. Her solo film has been a huge box-office success, and now Captain Marvel is adding an intergalactic element to the new-look Avengers team. Perhaps most telling of all is the mutual admiration between her and Thor. As the two most powerful Avengers, it seems only right that they'd need to size each other up. Fans are already loving the chemistry between this other-wordly duo. The Avengers got trashed, royally, when they tackled Thanos first time around - so they're taking things seriously for the second bash. The team is seen wearing smart new matching costumes in a scene set in an aircraft hangar. Many people believe they're quantum realm suits, something that has been previously seen in the Ant-Man movies. The quantum realm is linked with time travel in the Marvel universe and the trailer opens with scenes from earlier movies - suggesting a return to events before Thanos defeated the heroes. Not everyone's convinced with the new looks, however. Here's the full trailer. Avengers: Endgame is released on 26 April 2019.